Phone books often come with magnets, which are not recyclable. Make sure to remove these magnets before placing a phone book in paper recycling. If your phone book sees little use, consider opting out of receiving one altogether. Do so by visiting the National Yellow Pages opt-out site. Hide money and other small valuables in a phone book. To create a phone book safe, take a box cutter and cut out a rectangle from the middle. 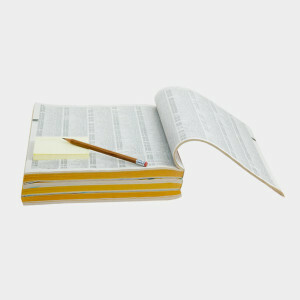 Each year, it takes 7.2 million barrels of oil to produce phone books in the United States. This amount is equivalent to half of the oil used annually by the state of Vermont.